Magazine Review:- Kishor Alo February 2016, is a monthly edition by Kishor Alo. It is most popular among children, school student and Teenager. 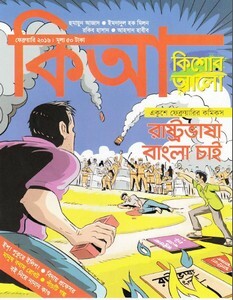 This popular Bengali magazine published by Prothom Alo from Dhaka in Bangladesh. This Edition cover story are comics about we want to national language in Bangla, stories of popular writers, teenager poems, technique, science, travel etc. View or Read Kishor Alo February 2016 ebook pdf.